1. In a heavy bottom vessel pour the milk and let it boil. 2. Reduce to 2 cups by keep in low flame by stirring occasionally. 3. Add the sugar once it gets melted switch off and let it cool. 4. Now to this add the mango pulp and mix well. 5. Refrigerate for few hours and while serving add the roasted nuts. You surely feel the divine. 1. Adjust the sugar according to the sweetness of the mango. 2. Rabri taste so good if mango is nicely riped and sweet. 3. While making mango pulp the texture would be great if you make coarse paste instead of making them smooth. Sure it is divine Pavithra...No words to describe about your presentation..
looks delicious Pavita....whos doesnt love mangoes :). superb dear.....i guess i shd search for new words.....and hey i added ur link in my blog sidebar (blogs i love to read)!! pass me that bowl please pacithra. will ya? 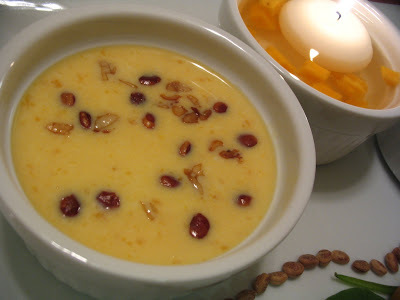 Looks delicious.Lovely Rabdi!Perfect seasonal dessert! Perfect rabdi!! Hardly words are enough to describe it..heavenly. I do have a doubt though..how long does it take(approx) to reduce the milk to half the amount? 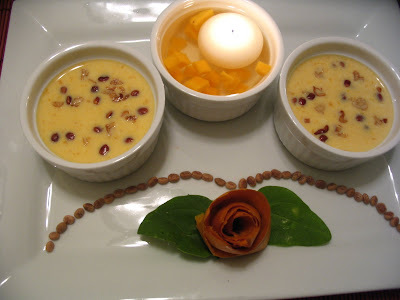 This was an easy and interesting way to prepare mango rabdi..
superb dish ! !Iam sure it taste's good. 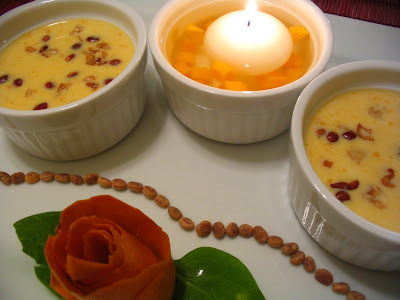 Lovely, fabulous and gorgeous rabdi Pavithra..
That refined dessert looks delicious! I really love mangoes! yum yum yum, that will surely be a hit :) delicious sweet :) lovely presentation! Looks delicious and neat presentation. This sounds heavenly with mango! Can't wait to try it! Hey am so sorry my reader is gone nuts like me...it has not been showing many ppl's post and I just checked you out from ur comment on my blog only to see you have posted so many dishes since I was last here. Yum I have some mango pulp so can definitely try this..Can you tell me what is that Charoli nuts called in hindi or any other language..lolz? Btw I made your hot and sour veg soup and it came out good and must say its so easy to make. I bet this did taste so delicious. I do not think I have used charoli nuts - unless they have a different name in the UK? Thanks for the reply..yup I know chironji...it just slipped away from my mind. My mom in law used to put them in kheer, halwa and all back in India. looks yummy..grt presentations....mangoes...who doesnt lov it..